Honeymoon Destination Recommendations For… Adrenaline Junkies! It’s pretty obvious that just because a honeymoon destination is really popular, it doesn’t mean that it’s right for everyone. One of the reasons why I started this blog in the first place is because the internet is full of websites that can tell you where to stay and what to do once you choose your honeymoon destination, but there aren’t enough sites that will help you decide where to go based on your personalities, time allowance, and budget. 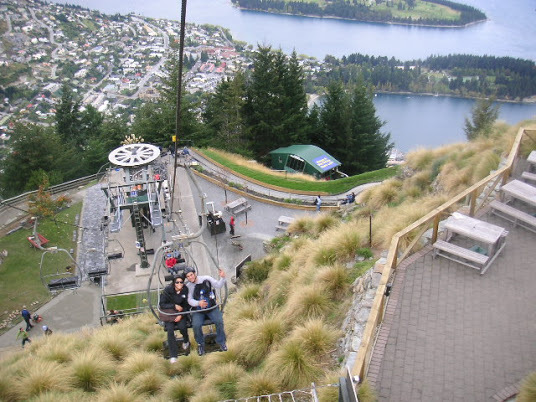 Queenstown is the city to visit if you like all things extreme. Not only is the city itself absolutely beautiful, full of good restaurants, nice hotels, and some of the friendliest people in the world, the adrenaline-pumping activities that the city has to offer are endless. 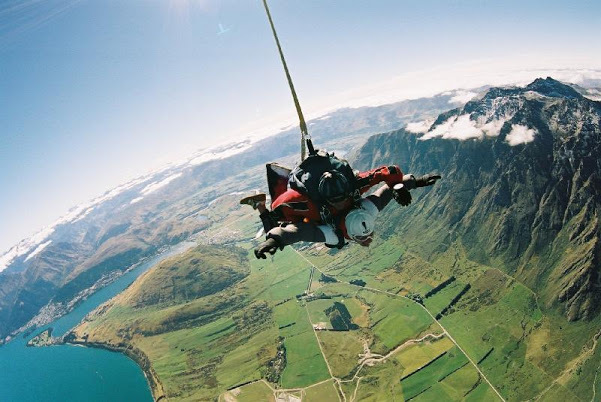 You can spend your days skydiving, bungy jumping (do the Nevis – it’s the highest in NZ! ), mountain biking, white water rafting, and parasailing, or you can take it easy with scenic hikes, cruising on Lake Wakatipu, and wine tasting. During the winter, you can also ski and snowboard on the Remarkables mountain range. I also highly recommend going on a Shotover Jet boat ride and then getting some cocktails at the Minus 5° Icebar. Is the icebar overpriced and crowded? Sure is. Do you get to wear borrowed jackets and gloves? Yep. Do the photos make it all worth it? Absolutely. Other fun things to consider doing are the street luge course and the ledge swing, but just a heads up about that ledge swing harness: it hurrrrts. If Queenstown is the #1 adventure destination in the world, then I’d say that Interlaken comes in a close second. Just replace the Remarkables with the Swiss Alps, and Lake Wakatipu with Lakes Brienzsee and Thun, and you’ll find that the two cities are very similar. Again, the backdrop of the city alone would be enough to make Interlaken a popular tourist destination. However, it also offers world-class skiing and snowboarding in the winter, and tons of fun summer activities like skydiving, hang gliding, bungy jumping, white water rafting, and rock climbing. 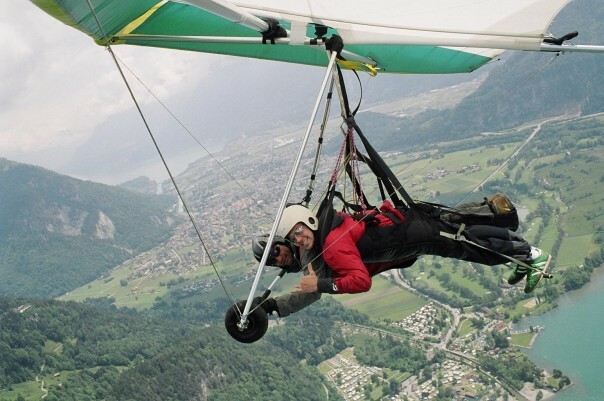 Since I had already done most of those extreme activities in Queenstown before I visited Interlaken, I decided I should do something a bit more unique when I was in Switzerland. I chose to go canyoning. 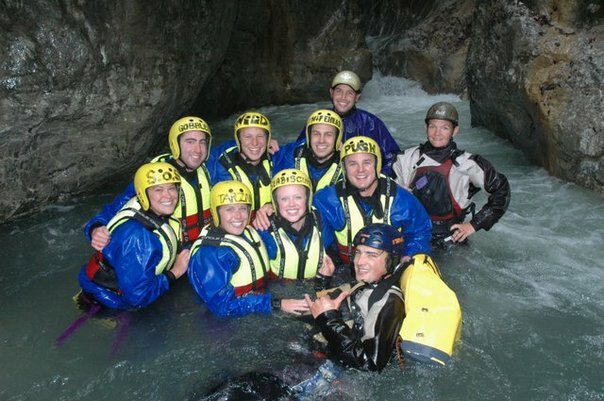 So, what is canyoning anyway? Well, first you start out wearing a sweet wetsuit, jacket, lifevest, and helmet. Then you basically just end up following your guide down a series of waterfalls with a combination of hiking, jumping, swimming, and rappelling skills. It’s all a bit blurry to me now, but I remember that everyone had a great time. Although I was just a backpacker when I visited Interlaken, my husband was lucky enough that his firm flew him out there a few years ago for a weekend hike. Yes, we live in San Francisco, and his law firm flew everyone out to Switzerland to go for a weekend hike. I was just a little jealous, to say the least. Anyway, they stayed at a very beautiful hotel called The Victoria-Jungfrau, and it sounds like it would be perfect for honeymooners. He said that the cleaning staff were like ninjas because he’d leave the room for a few minutes, and by the time he came back it would be spotless. One drawback to both of our Switzerland experiences, neither my husband nor I remember anything remarkably positive about the food. However, he did mention that there was a Hooters next to his hotel. Just where you always imagined eating during your honeymoon, right? The legend told is that the people who purchased the land adjacent to the hotel wanted to build a gift shop, but the hotel shut them down because there was already a shop in the resort. To get their revenge, the neighbors built the most spiteful (yet profitable) thing they could think of… a Hooters restaurant. Ah, Jericoacoara. The first thing you’ll want to know is how to pronounce it: jerry-kwah-kwah-ruh. Luckily, most people just call it “Jeri.” Although I lost the digital memory card full of all of my photos from Northern Brazil (insert sad face here), you’ll just have to trust me when I tell you that Jeri is a very picturesque fishing village turned hippie mecca turned kite surfing capital of South America. To get there, most people fly into Fortaleza and then take a bus and buggy ride to Jeri, but the fanciest folks go by helicopter. The roads are “paved” with white sand, so don’t even think about bringing a rental car. Leave the driving up to the pros. We planned on just staying in Jeri for 4 days, but we ended up staying there for a full week because the restaurants were so delicious, the scenery was gorgeous, and there was tons to do. Toursits enjoy all types of surfing (wind, kite, “regular” etc. ), dune buggy tours, sand boarding, horseback riding, and capoeira lessons. However you end up spending your day, everyone climbs to the top of a large sand dune to watch the sunset together every evening. There’s a wide range of accommodations in Jeri, from budget pousadas to high-end resorts. Although most hotels and restaurants accept major credit cards, make sure to bring plenty of cash with you as well since Jeri has no ATMs. (If you do run low on money, you can just hire a local guy with a dune buggy to take you to the nearest one, although it’s about 30 minutes away.) Enjoy a caipirinha for me! Oh my gosh! This place looks freakin’ awesome!